God doesn’t love me. But he’s given me these teeth to spill your blood and these words to speak over your remains. And when I do that, he’s going to make my dreams come true. God is good. Blood Sorcery lures us back to the beginning of Vampire the Requiem and takes a long look at one of the most interesting aspects of the game. 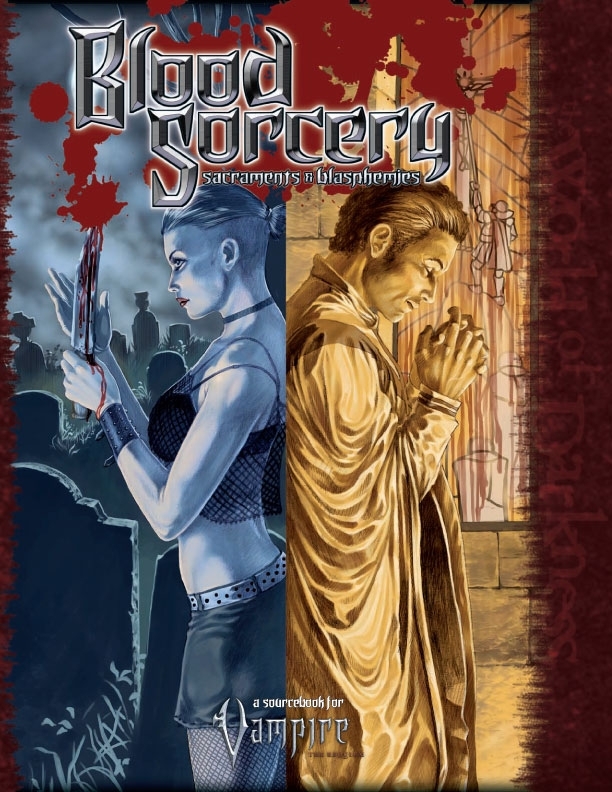 While blood sorcery has always been “good” it was probably not as well developed as it could have been in hindsight. The Storytelling system has matured and now Requiem is benefiting from years of experience with a revamp of blood sorcery, an alternative approach to the system and a plethora of interesting additions to your chronicles. 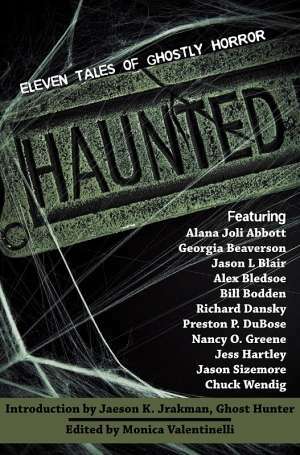 Coming in at just under 70 pages of content this is one of the best new books available to fans of Vampire the Requiem. Chapter One: Rites of Damnation takes Cruac and Theban Sorcery back to the drawing board and rebuilds it from the ground up. Characters purchase dots in Cruac or Theban Sorcery as normal (as long as the appropriate covenant Status ratings are in place). Instead of purchasing individual rituals (the old system) the character learns rites or miracles through Themes. The Themes (Creation, Divination, Destruction, Protection and Transmutation) are rated from one to five dots. Purchasing dots in Cruac/Theban Sorcery provides a certain number of Theme dots. Theme dots can also be purchased independently. Much like Mage’s Arcana the system is very versatile in effect but it does have its limitations. Blood sorcerers cannot summon fire or sunlight. 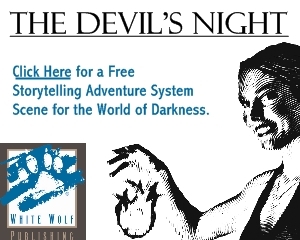 Nor can they permanently overcome the weaknesses of the vampiric existence. Blood sorcery also does not provide access into other realms. I think these limitations are important because they further differentiate between the capabilities of the blood sorcerers and the Awakened. They also anchor blood sorcerers as part of the vampire experience. No matter how powerful they become they cannot escape their nature… at least not for very long. The Circle of the Crone and the Lancea Sanctum are the big dogs when it comes to blood sorcery and they expend a lot of time and effort making sure that remains the status quo. Blood Sorcery does not openly challenge that premise but the tools do exist in the book to develop sorcerous traditions outside of those covenants. I liked that I could easily take this system and build something new and unique from it with very little effort. Chapter Two: Threnodies introduces an alternative to ritual sorcery in the form of extraordinary effects invoked through song and incredible sacrifice. While the effects of Threnodies can be extremely potent I feel like they are well balanced by the sacrifice which must always be painful. Whether this pain is physical, emotional or psychological the vampire is going to lose something important. Throughout each installment of Boon & Kitty (the short story parsed throughout the book) we find Boon appearing with fewer and fewer fingers over the years and they are not regenerating. He would consider himself lucky that is all he has lost. Threnodies are tied to Disciplines. Thematically if using a Discipline is a controlled interaction with the Beast then a Threnody is a more violent interaction which can result in something horrible if the Beast gets out of control. This happens whenever the character fails the die roll to invoke the Threnody. Heaven help the character who rolls a dramatic failure but then again that is when things get the most interesting, isn’t it? The repercussions can be quite dramatic although my personal favorite is when the Beast is let loose. No, the Beast is not in control it is literally let loose to run free as an independent entity. Is that a blessing or a curse? I don’t know but I think it makes for a great story. Chapter Three: Antagonists is a collection of occult-oriented antagonists to add flavor to your chronicles. These characters, organizations and locales are great foils for blood sorcerers or those looking to dabble in the bloody occult (or hire others to do it for them). The Onyx Path continues to take the World of Darkness in new and interesting directions and Blood Sorcery is a great addition to Vampire the Requiem. The new blood sorcery system is a welcome improvement and Threnodies are going to see a lot of game play because I think you will like them as much as I do. The antagonists section of this book is a gold mine. Enjoy.